THE writers of the New Testament TAUGHT by the SPOKEN WORD/ They where Preachers, meaning they taught by Speech, Speaking out the Good News. The written Word has become the letter of the Law, it is NOT PRODUCING anything SUPERNATURAL. People are using it just like they did the LAW, and don't even get it? JESUS IS THE WORD MADE FLESH/ THE PROMISE GOD SPOKE to our Father Abraham by FAITH. The SPOKEN WORD of FAITH Was Imparted unto Mary, who Had the FAITH to Receive it and ACT on it. ONLY SPOKEN WORDS of FAITH are Seeds that are Sown into Hearts that will Hear. Telling others who they Are and what God has done for us by Sending us his SON/ Teaching others they can become ONE with Christ, telling others they can become a SON OF GOD. JESUS is COMING AGAIN through the Next Generation of the SPOKEN WORD which will become FLESH. THE INCORRUPTIBLE SEED, PRODUCING and EVOLVING. 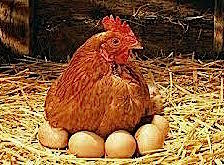 SO the egg can not Replace the Chicken/ THE CHICKEN is the SPOKEN WORD/ The Spoken Word is what Hatched or Produced the Egg, the written word. JESUS is the Off Spring of MARY'S FAITH, that was the Seed of Promise Produced by Abraham's FAITH / GOD SAID Something and It Manifested. Each Generation of the INCORRUPTIBLE SEED is More Supernatural then the generation that came before/ The Incorruptible Seed keeps Producing something MORE SUPERNATURAL as it EVOLES/ it keeps on Evolving on into eternity etc. ARE your WORDS becoming FLESH?